RangeVision is excited to announce the release of the first update for the ScanCenter NG. 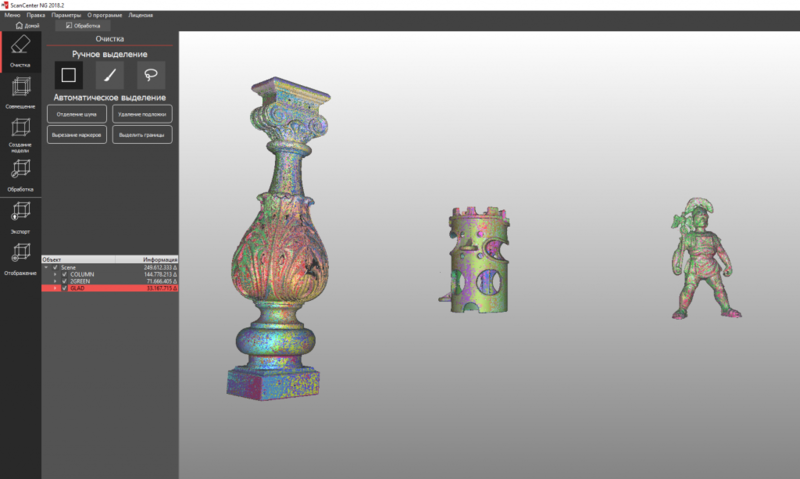 In July our 3D scanning software went through a change of concept, uniting ScanCenter and ScanMerge in one dark-shaded interface. You can find more about this event in our news section. The ScanCenter NG 2018.2 is already available for download. All software updates are still free for all RangeVision users. Simply remove object and press “Scan background” in “Scanning menu” to scan area in the field of view of the scanner. After that enable the “Cut background” option and put your object back. The background will be automatically excluded from the following scans. Beside it, it is possible to scan only markers. Give it a try by opening a project with markers and going into “Markers” menu on “Scanning” tab. Processing mode is accessible from the “Start screen” and from the drop-down Menu. In this mode all data is only stored in RAM, so, in order to save changes, you need to export data to .rv3d format. 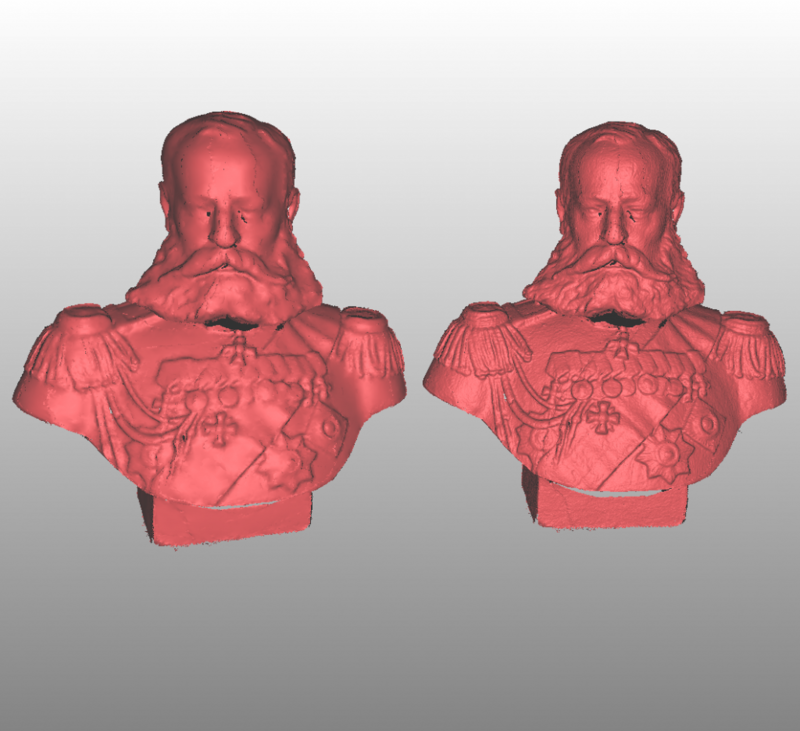 In processing mode you can import data in formats .rv3d, .x, .scanproj, .stl. To get back to scanning you need to exit the processing mode. The amount of memory taken by the project is reduced by simplifying scene objects, which is helpful when using a computer with little RAM. Simplification is also needed when scanning large objects, where high level of detail is not necessary, for example, a car body. Simplification is applied by clicking “Settings” → “Software” → “Simplification”. Use the slider to specify the needed level and press “Simplify current project”. If option “Simplify project after creation or opening” is enabled, simplification will be applied automatically. Our developers have improved the turntable calibration algorithm. 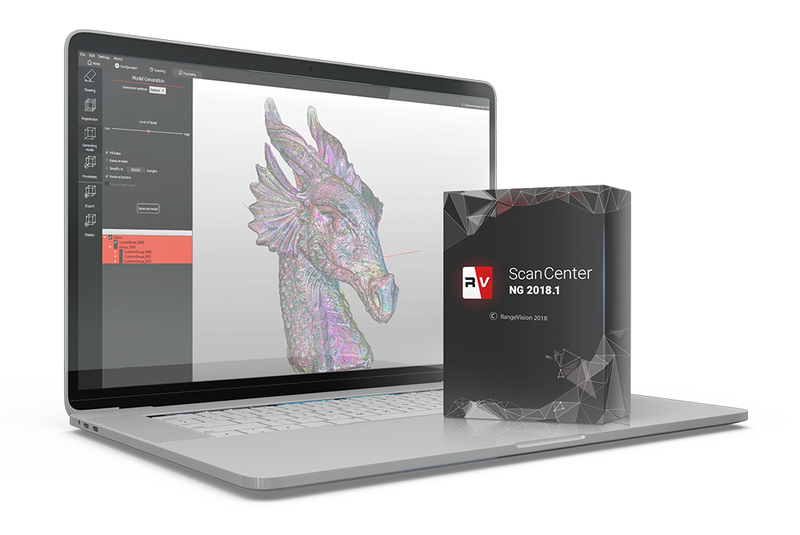 Now ScanCenter NG can more accurately detect the field orientation and automatically adjust the turning direction, providing the correct placement of model in the scene. It can be found in the top right corner and it shows the current percent of RAM used, so the user is able to apply simplification and maintain performance if needed. RangeVision developers continue to work on the software and are open to feedback and suggestions. ScanCenter NG educational videos are available in the download area. Contact support@rangevision.com if you have lost access to the download area. Watch the demonstration of digitization process using RangeVision PRO and Spectrum scanners and new NG software. Scanning in ScanCenter NG.